met from the 26. till the 28. Juli 2013 in the Steigerwald. 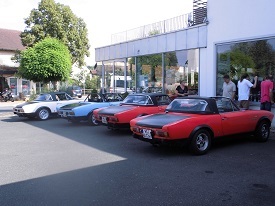 The place to be, was for me clear since we met at the lake Constance, because what should top the first meeting, if not the visit of the Abarth collection of Leo Aumüller. 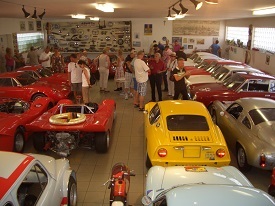 The Abarth pope owns one of the four worlds largest Abarth collection and we were allowed to come. 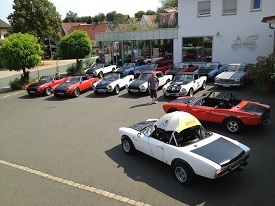 The arrival was done in an Abarth-sandwich (red/white/red) from Bergisch Gladbach to Olpe on the highway and from there only on country roads. 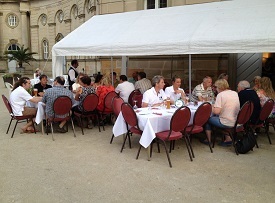 At approx 16:00 o' clock we arrived in Schönbrunn and met on the parking area of the Autohaus Aumüller a powder blue CSA with it's pilots, who have waited there for us. 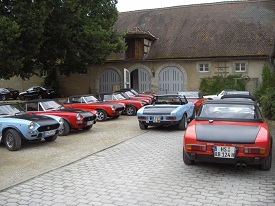 Leo Aumüller was at that time busy with the preparation for the Saturday, so that we decide to visit his brother Helmut, to take a look for his cars. Before we go at approx 17:30 o' clock on the way to the castle, we had the pleasure to hear something, which all of us like and this was the sound of an incredible car, the Fiat Abarth 2000 OT America Coupe. Leo Aumüller takes his beauty for a ride on that day...like we also did with our CSA, so we take the for saturday planed third part of the tour, from Schönbrunn and Ampferbach to the castle in Pommersfelden. Curvy streets, up and down the hills, it was just fantastic. 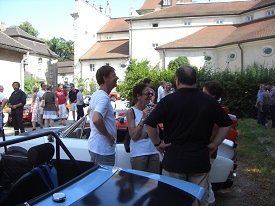 As we arrived at the castle, our happiness rise more and more up, because there were the others with their CSA cars, who also come from different place in Germany, Switzerland and probably the longest arrival from the Neatherlands. Henk and Meily had 650 KM to drive. the diner on the Friday evening. The only thing, which was open to do, was to take a seat in the court of honour, because all had a long arrival and we were hungry and thirsty. The buffet lets us no open wishes, wine and weiss bear, comfortable talks of classic cars and other topics - there was nothing to miss. The time goes to fast ahead, and so the first went sadly at approx 23:00 o' clock to bed, to be fit for Saturday morning. Actually all of us could have talked a long more time, but so it was also finish for the last at midnight, because the court of honour had to be prepared for the upcoming wedding on Saturday. The saturday morning starts at 07:30 o' clock, as the first started to wash their CSA's and goes then ahead with the breakfast. Under this 8 CSA cars were also the cars of Leo &Hedwig Aumüller and Stefan & Margarete Kellermann. 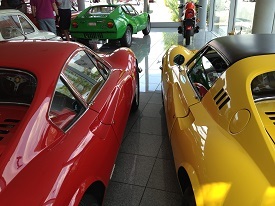 Without one of this pairs, the meet would be probably impossible, because Stefan checked my by Google Earth created tour of correctness and kilometers, and Leo Aumüller opens the gates of his famous Abarth collection. In the faces, i saw question marks with the time, who would like to know, when we go for the ride, and so i pushed the signal horn of my CSA and shout „Abfahrt!“ - it means let's go. Florian understood at first "Abarth" ;-) - understandable by this atmosphere -, but I shout once again "Abfahrt" and so all go for the ride. The ride guides us 140 Kilometer through Mittelfranken, Oberfranken and Unterfranken. We drove over small streets, on long snaky straight roads, up and down through the Steigerwald - the wood passages were just brilliant. We could go there with the full power of our CSA's. In the first 90 kilometers, we drive through Höchstadt, Schwarzenbach, Dachsbach, Baudenbach, Burghaslach & Geiselwind to Ebrach. It could be meant, that i let close all the streets, where we go, because there was more or less no traffic and that on a saturday in the summer, but i don't - there was really no traffic except of us and all like it. The up and down, and the little snaky streets in the Steigerwald are just unbelievable dreamy to drive. For the lunch break all are together again and fascinated of the look. Smilie faces all around, but with the time, we decided to go into the beer garden, to relax a little bit. After a little longer break than planed, we go all for the next part of the ride, which should bring us now to Schönbrunn, but before we go once to through the Steigerwald, up and down, just fantastic. Also this 30 Kilometer over Rauhenebrach, Fabrikschleichach, Dankenfeld, Trabelsdorf and Lisberg are nice to drive, brilliant again, when i think right now again to it. Leo Aumüller was a short time before us at his place, because of some preparation, but many time he hasn't. As we arrived, he asked us, if we flew there and yes, we did, we flew again with full power through the Steigerwald. and follow his lips. It is just like madness, what he has all to tell. He begans with the poison green 1300er Scorpione SS, turns then to an MV-Agusta, which has on it's tank a sticker, which has many stars on, where each is for one race victory. the little A112, the Lancia Delta Integrale, his Fiat 131 Abarth & the rare Lancia 037. Don't forget, the orange Lancia Stratos. We went a few stairs up, where an Abarth Monoposto, 3 Fiat Balilla Sport Spider and a little creme colored Fiat were standing, who's chassis had no doors, but the area is deep cutted out. his youth one, which he likes most, because the one has no doors, and so it was possible to enter easily. 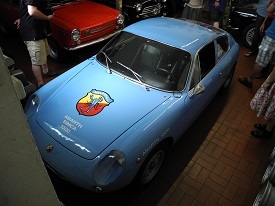 Now it goes in direction of Leo's main work shop, because till now we have been only in the exhibition rooms, and so we pass a light blue Simca Abarth 1000, which i have seen last time 5 years ago on the International Abarth Meeting of Michel Pont and also on the beloved car of his wife. Abarth Allemano Spider 1600 with beige interior and soft top - a real dream car. In his work shop, my eyes fall at first, who is wondering, on his white CSA, which was a few hours ago with Mr. and Mrs. Aumüller on the roads through the Steigerwald. In the meantime, the car was on a car lift, so that it was easy to take a look for the white underbody. In addition there were also 2 Fiat Multipla buses in the work shop. One was still finished and the other one waits for completing. Who is thinking, that's it, is wrong, because after we had some more water for refreshment, which was sponsored kindly by Helmut Aumüller, the most of us went by feet to Leo Aumüller's house, where the second part of his collection is located. In front of the hall was standing the little 595, with whom Leo was riding up, and next to it one Bialbero and the extrem rare Fiat 2000 OT America Coupe, my absolutely beloved car of his collection. Leo explains all people then the details of all three cars, what was really interesting, and especially, who he comes to the 2000 OT and the engine of it. 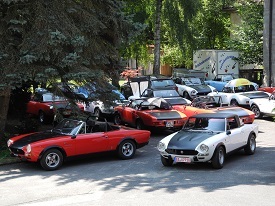 Not to forget the four Fiat Dino - 2,0 L Coupe, 2,0 L Spider, 2,4 L Spider and 2,4 L Coupe and lots of spare parts and cups. It is simple an impressive and unbelievable history of life. 20 Kilometer back to the castle. My co-driver gets out in front of the castle and I drove with 3 other CSA to a small cafe, which was next to the castle, where we let repeat that day and said to each other: "What for a ride :-)))"
A few minutes before 19:00 o' clock, we went back to the castle, because the diner was ready to start, and we won't come to late. 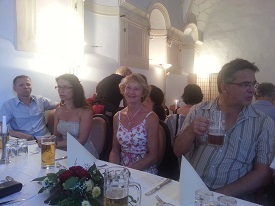 Some participants were still sitting in the baroque hall, to whom we come too, before the evening event begun. Given that all meals were pre ordered, we haven't wait to long for them, and so we just ordered the drinks. Before we got the meals on the tables, Helmut Aumüller was going through the lines asked each participant for a little donation for my coordinating work for that meeting. I was internal really touched, because i have never count with that, and so i was really happy about this way of . 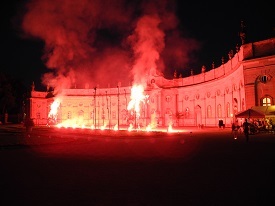 Because it was really warm in the baroque hall, all go with the time in the court of honour, and so we were there again, where we have been yesterday evening, Open Air. The clou of the Saturday evening was then the classic concert of the Collegium Musicum, which plays tracks in honour of the 200 years ago borned Giuseppe Verdi. 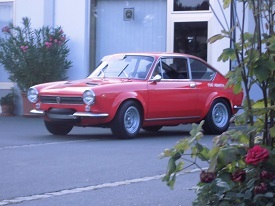 The really only thing, which was missing now, would have been a fire work, and off course, we had also this like on the first Fiat Abarth 124 Rally meeting at the lake Constance. I looked for it before on the internet, but it was fantastic! Some of us take their chairs and went more in direction of the castle, in the court of honour, to have this beautiful view for the fireworks and therefore they could really enjoy it. Amongst others, Erich was sitting next to me, and he was asking me: "Sebastian, how do you arranged it again with the fireworks?“ My answer was: „It's everything a question of organisation." As the fireworks and the concert were over, we are looking again for the wine and with a bottle of wine of the 2009 Abarth international meeting, i could tell a few guys, what a kind of magic is there, and so they could become taste for the 3rd Fiat Abarth 124 Rally meeting, which I like to organize again in 2014 at Michel Pont's international Abarth meeting on his castle in Savigny-lès-Beaune. 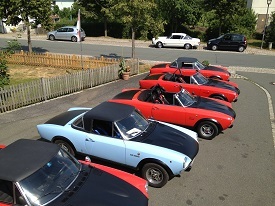 This sentence seems to make the round very quick, because right now it is said: "The next invitation is shouted out, we will meet again in 2014 in France on the International Abarth meeting of Michel Pont and als accepted". I will do my best again, there it will be the 3rd unforgettable CSA meeting. On Sunday morning we have to say sadly goodbye... The goodbye was so hearty like the hello, but not so nice, because this unbelievable, fantastic and undescribable meeting was over. Thanks to all, who have helped with their presence to make this meeting so successfull. Without you, i had never the chance for that success and so you make the meeting unforgetable. I hope we meet again in June 2014 at Michel Pont's castle in France.